Paddleboard lessons – book now! Welcome to SUPsect – Stand-Up Paddle South Essex Club & Tuition. Stand-up paddle boarding school, tuition, coaching, club and tours in South Essex on the Thames Estuary, based in and around Leigh-on-Sea… We also run SUP lessons at Paper Mill Lock on the River Chelmer near Chelmsford. Learn all you need to know about stand-up paddle boarding in our 2-hour Learn to SUP lesson, then come and join our regular free SUP Club sessions (see our location guide). Come and join our free SUP Club every Wednesday throughout summer – suitable for all Ready to Ride graduates and free with your own kit! Come join us at SUP Club – it’s free, every Wednesday evening throughout British Summer Time! "Best £50 I've spent for ages. The instructors are friendly and very knowledgeable. They make time for everyone and cater for all levels. I felt very welcomed and a great vibe was created for all. If you are thinking of it then stop thinking and book and have a go. You won't regret it!" "What a fabulous lesson! Duncan and El have great patience and teaching style. Thanks guys." "Dunc and El are very knowledgeable and fun instructors. We had a great time learning with them." "Really good lesson. Great instructors. Would highly recommend..."
"Had a great laugh today at Paper Mill. Thank-you El and Duncan for your tuition..."
"Duncan and Elisa were great instructors really friendly patient and informative. Absolutely loved the Ready to Ride course great way to learn the sport and a great way to spend a sunny Sunday morning." "Absolutely fantastic both Duncan and El were brilliant, such good instructors very patient and really fun! Just a brilliant way to spend a Sunday morning!!" "Brilliant course, excellent training. Couldn't stay up before I went on the lesson, but managed to get up pretty much straight away after learning how! Best birthday gift ever..."
"Dunc and El were SUPer professional. Loved every minute of it, thanks guys!" "Had an awesome lesson today. El and Dunc are fantastic teachers.vLearned so much in the lesson and managed to stay dry!! Woo! Everyone was included and it was a great fun time..."
"Excellent afternoon out on the river with Duncan and El, they're great instructors and teach in a relaxed fun way. If you're thinking about taking up stand up paddle boarding this is the way to start." "If you want to learn to SUP properly I highly recommend booking one of these sessions. Duncan and El are amazing, patient teachers and had us all standing in no time. A really fun learning experience." "Awesome afternoon! Huge thank you to Duncan and El, both friendly and professional and brilliant teachers. No one gets left behind and they cater for all abilities..."
"Had a fabulous fun morning on SUP in the sunshine on Papermill Lock ... Duncan and El are fantastic instructors, patient, good sence of humour and very knowledgeable. Would 100% recommend..."
"Brilliant, brilliant, brilliant! Duncan & El are great teachers and lots of fun. Thank you for introducing us to SUP, would definitely recommend you guys." "Brilliant day. We loved it, the teachers were friendly, engaging and made sure everyone knew what they were doing!" "What a fantastic morning at Paper Mill Lock, Little Baddow! Thanks so much for your kindness and patience, and as a complete beginner the pace of teaching was perfect..."
"Great first lesson at the weekend with fab instructors! Will definitely be back for more!" "Excellent instruction from Duncan and El. My nerves left me soon after we started as they were so relaxed and had a 'can do' attitude. Loved it all..."
"Just finished my first lesson and I think I'm hooked. Great teachers, well paced lesson and a great way for a beginner to get into board sports. Get involved!!!" "Absolutely brilliant afternoon with two very special instructors. El and Duncan were excellent teachers and really really lovely people. We had so much fun learning how to turn the board in different ways and the location was spectacular." "What a fabulous way to spend an afternoon and El and Duncan are the NICEST people! So friendly and patient and effortlessly cater for those on the course depending on their ability. Beautiful scenery and we had the best time. Can't wait to do this again – thanks guys." "Had a great afternoon on the beginners course, everyone was so lovely & friendly, great instructors and I loved it even falling in! Thank you." "Had an excellent time this afternoon paddleboarding. Everyone was super friendly and brilliant teachers. Thank you so much x"
"Both El and Duncan were brilliant teachers and very friendly ... would recommend it to anyone of any age – thanks for a brilliant day out." "Duncan and El are brilliant teachers with a really lovely group of people to learn with. Don't hesitate to book with these guys – first class." "I booked a sup lesson for my husband and he loved it! Really nice people teach the skills needed and support and further advice if needed." "Great club and instructors. Really enjoying it." "Had my lesson today and absolutely loved it. Was really nervous but the great instructors helped me all the way. Would recommend to everyone to have a go." "I must say that El & Duncan are great at what they do, making everyone feel relaxed and able to feel part of the team... Anyone thinking of trying out this great new sport should give it a go and contact Duncan & El to get the most from it as possible." "I would actually give a 7⭐️ as Dunc and El were absolutely professional, super patient and friendly! I am so pleased that I went on this course with them and would highly recommend it!" "Despite being nervous and not as young as we were, my friend Anne and I had a great time on the Chelmer today and learned a lot. The instructors were great ... patient and fun but very professional. Recommend it!" "Their instruction is exemplary and the attention to detail was amazing ... I would highly recommend anyone wanting to learn to contact them. Pleasure..."
"Great advice, tuition and equipment from the team and not forgetting SUP is fun too!" "What an excellent way to spend an afternoon! Dunc and El the instructors were amazing, super friendly and supportive, and knew how to get this bull in a china shop (me) under control lol!" "Just had a session with Duncan and Elisa. Brilliant instruction and lots of laughter." "Duncan & Elisa are excellent instructors, so patient and helpful ... and the whole experience was just stress free and amazing fun!" "Had a very enjoyable afternoon Saturday learning to SUP. Very well run course, Duncan and Elisa are brilliant instructors. Looking forward to attending SUP Club." "Really good lesson set in beautiful surroundings with helpful and knowledgeable instructors, highly recommended." "Excellent instructors and the weather was perfect. After I got over my initial fear I loved it!" "Had such a great time very friendly and helpful – highly recommended." "Really good fun out on the river this afternoon. Andy and I enjoyed it very much and appreciated the high quality tuition and equipment." "Absolutely loved it, had a fantastic time, great lesson, great fun with great instructors; thank-you x"
"Had the most amazing time - loved every minute of it and can now all SUP like pros. Thanks so much." 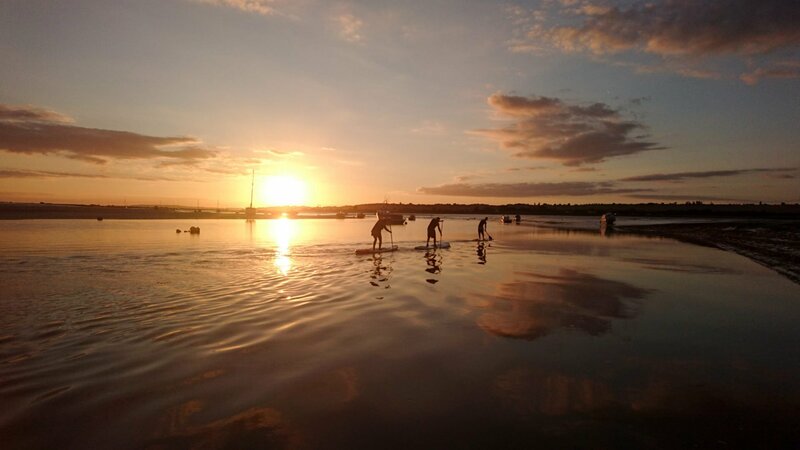 "Brilliant first paddleboard lesson lead by experienced, helpful instructors... Thanks Dunc and El!" "Thank you guys for a great afternoon at Paper Mill Lock. Myself and my boyfriend Adam had a blast! This is defiantly a sport we are going to take up..."
"Really enjoyed my SUP lesson on Sunday morning. The trainers were excellent and the location is perfect for any 1st timers. Cannot wait to do it again." "Really had a great time, excellent for fitness and Duncan and Elisa were lovely people I'm gonna join the club!" "Great team and such lovely people. Can't wait to join the club..."
"My group of five attended the beginners course last weekend and all loved it. Elisa and Duncan are so good at what they do, and really nice people..."
"Great teachers, very patient. Had a really fun lesson. Would love to try it again." "Great team of instructors with Duncan and Elisa! Had a fantastic lesson on Sunday and have no just returned from buying by first board..."
"Duncan and Elisa are excellent instructors. Fun, informative and makes it feel like it is a 1:1 instruction session. If you are looking to learn or looking to improve your paddle skills then look no further!" "Great 1st SUP lesson today. Duncan & El are excellent instructors and have lots of patience delivering a brilliant class..."
Blog #37 – it’s summertime! Blog #35 – Blazing February! Blog #33 – Ice and EASI! Blog #20 – school’s out! Blog #18 – world class! Blog #17 – Lovin’ Summer! Blog #10 – Bank Holiday Fun-days! Blog #7 – On SUPfari! Blog #2 – Staying Frosty! © SUPsect 2019 – SUP South Essex Club & Tuition. 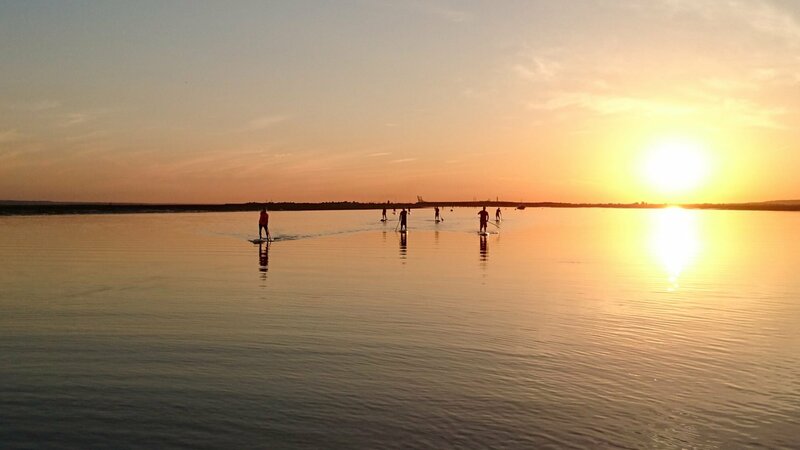 Stand-up paddleboarding school, tuition, coaching, club and tours in South Essex on the Thames Estuary, based in and around Leigh-on-Sea. No reproduction without written consent. Sixteen of us enjoyed a truly amazing SUP Club from Two Tree last night – breezy, yet not so bright in the end as the mist came in, but we'll all remember it for some close encounters of the animal kind. First a friendly young fox came to see us in the car-park ... but then, a super-sociable seal decided to join the club at the dogleg: not just following and checking us all out at close-quarters, but actually trying to climb aboard several boards! Against the flooding tide and easterly wind, our new friend followed the front-runners 4k out down the Ray before we turned and flew home.